Successfully Added Handheld Digital Compass (Deluxe Edition) to your Shopping Cart. 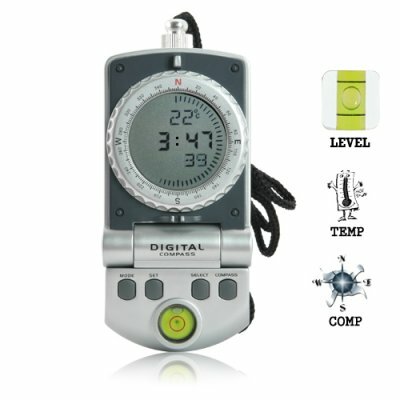 Deluxe Handheld Digital Compass with digital thermometer and clock functionality. Portable, practical, and priced right. Includes free car kit and free lanyard! This deluxe digital compass is the perfect handheld device for indoor or outdoor orientation. Find yourself getting lost in those huge shopping malls? This deluxe hand-held digital compass will ensure that you find your car everytime! And if you enjoy camping, hiking, or other outdoor activities, this navigation device is indispensable! Constructed from rugged, yet light-weight space age polymer, this deluxe handheld digital compass comes with spirit level gauge, direction dial, and declination functionality. Picture this: You've spent the day trekking through heavily forested terrain not getting lost once thank to your trusty handheld digital compass. You make your way to a beautiful clearing and decide to set up camp. After a hearty meal of lake trout, you lay your head down so you can get up early next morning for some more oneness with nature. Thanks to the OG06 Handheld Digital Compass. Comes with its own foldable stand. Comes with spirit level to gauge levelness of ground and campsite. Why is this digital compass so inexpensive? That depends. If you're a consumer, go for a long walk and be one with Mother Nature. If you're a reseller, tell your bank to build another vault for all the money you're going to make with this baby!